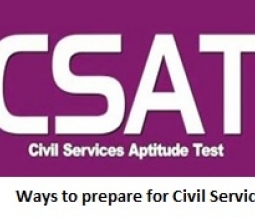 Due to the fact that the Civil Services Aptitude Test (CSAT) is one of the world’s toughest exams to compete in, the very idea of preparing for it creates a stir in the minds of the aspirants. The history of this exams states that many of the students have to appear several times to clear it and yet the success ratio is 1:100. The basic idea for developing this test is to judge the analytical skills of the candidate along with his/her decision-making capabilities. The test aims on choosing suitable administrators who have the inherent instinct for management and administration. Before you start off with your preparation the first and the foremost thing you should emphasize on is to know the whole format of the examination in a comprehensive manner. To have known the whole format helps the student to be up to date with the current trends and the examination patterns. These details can best acquired by getting in touch with your teachers, seniors and various online portals. Starting with the prelims, the basic misconception that a student faces is the notion that this test is all about facts and figures. In reality all you need to have to clear the prelims is the determination to actually crack it. One should have the right strategy, a proper frame of mind and quick decision-making power to perform well in the prelims. In the prelims one’s fundamental knowledge about various subjects and topics are tested, so it is very important that one should have an in depth knowledge of these topics before hand and in order to achieve this one should thoroughly read the NCERT books of class 6 to 10th in general science and social science (polity, sociology, history and geography) to systematically build up their fundaments’ base. This is the last step before you finally crack this elongated process. Well personality test as the name defines; one is expected to be rational, quick in response, analytic and of course should have a convincing persona. Whatever the situation is one need to be calm and confident and this the only mantra for succeeding in this part of the examination.